It looks complicated, but it’s not complex. It’s basically a cascade of first-order delay processes: the outflow from each stock is simply a fraction per time. There are no large-scale feedback loops. The parameters for some of these curves are estimated one at a time from data reported in the paper. Open-loop estimates sometimes work in integrated models (contrary to this), particularly if there’s little feedback and measurement error isn’t a big problem, as in this case. With the joinpoints working, I imported parameters from tables in the paper and fired up the model. 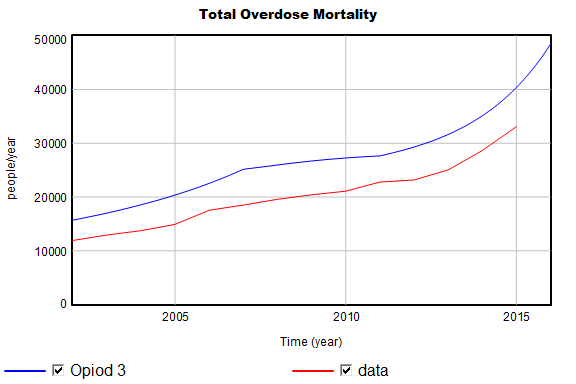 Total mortality is biased upwards somewhat. 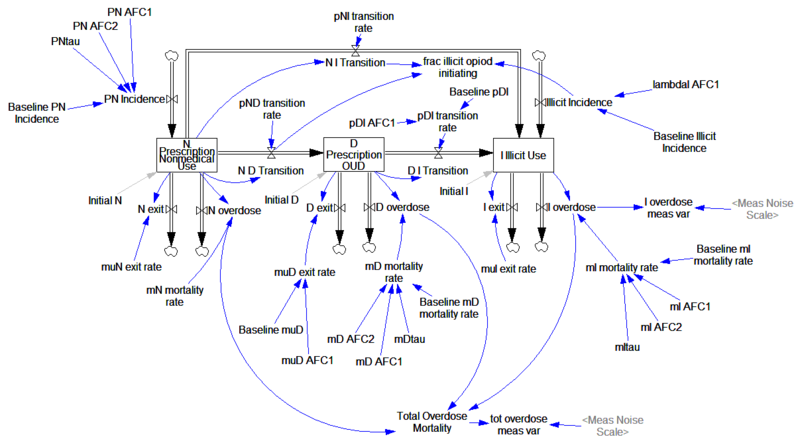 It’s fairly easy to causal trace and discover that some combination of D overdose and N overdose must be the cause (I overdose and some other candidates are ruled out because they’re constrained by data). 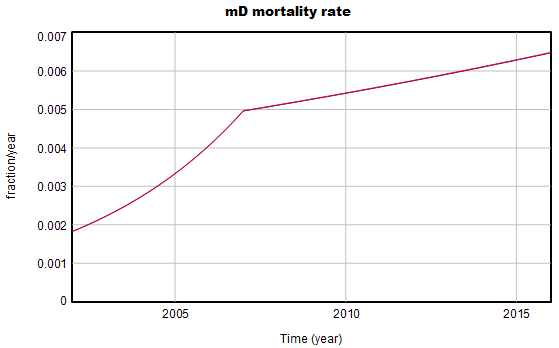 Modifying the baseline Md mortality rate slightly removes the bias in the curves above. From the paper, we know the marginal distributions of the parameters, but not the joint distributions. 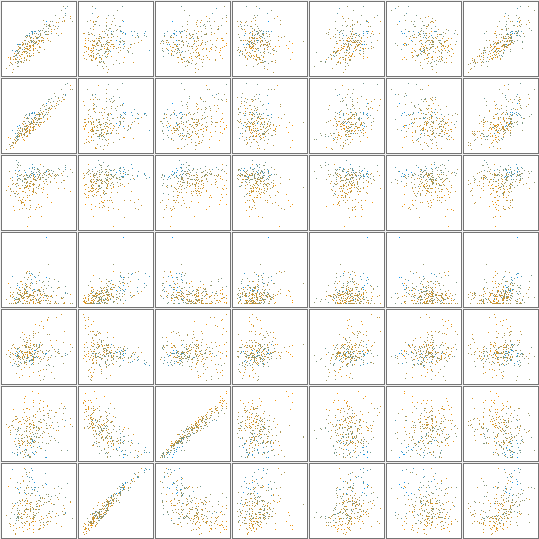 Some of the distributions are also highly skewed. So, the behavior of the model with all the marginal mean parameters doesn’t necessarily match the mean behavior of the model. 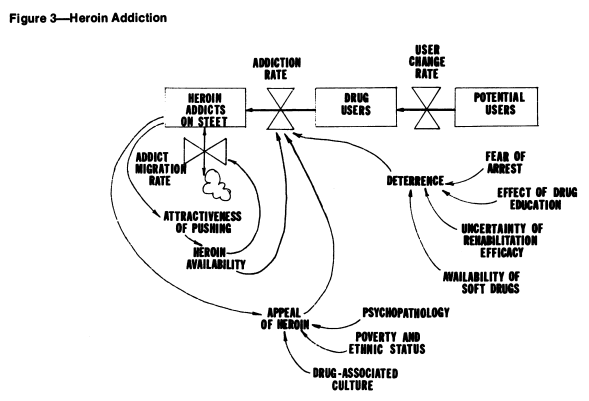 Here (and in other SD work), some key drivers are represented, like deterrence, and the positive loop of users becoming dealers and engaging new users. Which approach is better? I think that depends on your purpose. The present model is simple and well grounded in the “physics” of population stocks and flows. That makes it easy to identify which particular parameters (in particular, the slopes of the various joinpoint segments) have high leverage on future mortality. At the same time, heavy use of joinpoints (or more generally, time-varying parameters) essentially makes all the interesting behavior of the model exogenous. If you want to find leverage points, you need a model that spans enough of the system to include key feedback loops. This model suggests where to look, because large populations or strong trends suggest that a significant number of people will be harmed. If you want to know how and why things are changing, or if you want to interact with stakeholders to fix the system, you’d have to know more about the causal drivers. Is the influx of illicit users due to reinforcing word-of-mouth? Or are drug dealers reinvesting there earnings in marketing? This archive contains the model in Vensim .mdl and .vpm format, with supporting optimization control files and the datasets shown above. It should work in PLE, but you really want Pro or DSS to explore parameter estimation and other advanced features.